With all the water and energy savings that high efficiency washers provide, they still require special care. After normal use, mold, mildew and odour-causing residue may form in hard to reach areas of your washer. Affresh washing machine cleaner is specially formulated to remove the odour and clean the stains left behind by mold and mildew. - The powerful, oxygenated action of Affresh washer cleaner penetrates, dissolves and reduces or removes odour causing residue and sends it flowing down the drain. - In the time it takes to run one normal or 'clean washer' cycle with hot water (without clothes), your washer will be residue and odour free again. To keep your washer clean and fresh, use one Affresh tablet once a month. - When a strong odour is present, run three consecutive washes (without clothes), using one Affresh tablet in each cycle. - While bleach can kill the bacteria that cause odourous residue, it is not as effective at removing the residue itself. Only Affresh washer cleaner is proven to penetrate, dissolve and reduce or remove the residue that causes the odour. The NEW Affresh Dishwasher & Waste Disposal cleaner is the powerful, ground-breaking solution for unwanted dishwasher odour. These innovative tablets help prevent odour in the dishwasher and waste disposal. Developed for easy use, these cleaner tablets help remove even the most stubborn odours from dishwasher and waste disposals. Affresh tablets keep the dishwasher or waste disposal fresh for up to a month by penetrating, dissolving and removing odour. It's a fast and simple way to keep the inside of these appliances clean and smelling fresh. Each Affresh Dishwasher & Disposal Cleaner pack contains 6 tablets. 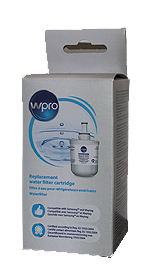 Use once a month or as needed for a cleaner, fresher dishwasher and waste disposal. 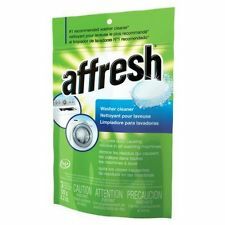 Affresh stainless steel cleaning wipes for use on stainless steel refrigerators, dishwashers, ranges and microwaves. Each handy dispensing tub contains 35 wipes. The durable, distinguished look of clean stainless steel can really make a kitchen shine. Keeping that look, though, has always been a chore. Until now. 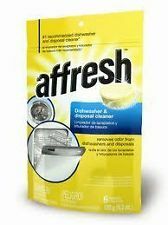 Affresh stainless steel cleaning wipes can be used to easily clean fingerprints, smudges and residue left behind from daily use. Affresh Stainless Steel Cleaner gently cleans fingerprints, smudges and residue for a streak-free polished shine. Just spray the surface, then buff with a soft cloth, leaving behind a pleasant fresh plum scent.